Aero Wine Aerator - Stainless at Brookstone—Buy Now! Better wine in less than a minute—experts agree. Enjoy better tasting wine every time. Better wine—by the bottle, or by the glass. Our Aero™ Stainless Wine Aerator releases each wine’s full flavor and bouquet potential for better tasting wine no matter what. It softens the tannins of young and darker wines, and “opens up” and releases complex flavors and aromas. Aero works well with any type of wine—just press the button once for older and lighter wines, or twice for younger and darker wines. We included two different aeration stems so you can aerate an entire bottle (in less time than it would take to pour the wine into a decanter!) or a single glass. The Aero Wine Aerator, Stainless Steel, was named a Red Dot Award Winner for 2014. The Red Dot Award is recognized throughout world as one of the most prestigious awards for excellence in product design. 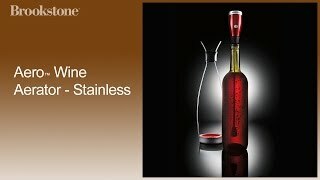 Order your Aero Stainless Wine Aerator from Brookstone today!